As campaigning gathers momentum for the assembly elections in Bihar, the Congress held a farmers' rally in Delhi, in which party chief Sonia Gandhi and her son Rahul Gandhi took on Prime Minister Narendra Modi, in whose name the BJP is seeking votes. The BJP Hit Back within hours, with Union Minister Venkaiah Naidu said Rahul Gandhi was taking the Prime Minister's name to "remain in news". At a rally attended by thousands of farmers -- their turbans resembling like a sea of pink -- the party sought to underscore what they call the pro-corporate image of the government and heaped scorn on PM Modi's Make in India initiative. It is not Make in India, it is Take in (From) India, Rahul Gandhi said. "There's no place for labourers and farmers in his Make in India. Only his (PM Modi's) selected friends will benefit from it," he added. Calling the government's U-turn on land bill following the recommendation of a joint committee of Parliament a Congress victory, Mrs Gandhi said Prime Minister Narendra Modi did not understand the "seriousness of the protest by the Congress Party". "When he saw the power of protest he had to take a step back," she said. "The battle (over the land bill), she said, has now shifted to other states." The Congress had launched a protest against the amended version of the land acquisition bill, which was to replace the law passed by the UPA government in 2013. Following a massive protest by the united opposition, the bill had to be sent to the joint committee of Parliament and the contentious clauses were dropped. But Mrs Gandhi said the situation of the farmers has not changed. "There is problem of drought, water, electricity," she said. "The Modi government has not the time or inclination to solve their problems." 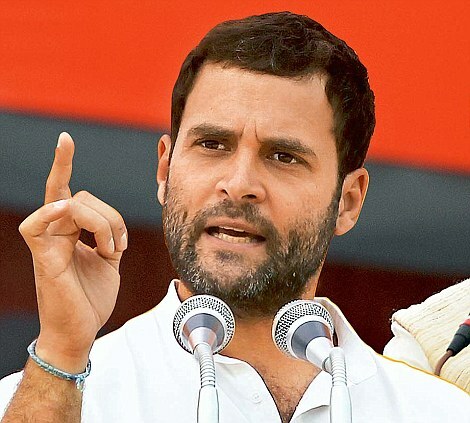 Rahul Gandhi had held a rally in Bihar's West Champaran district yesterday. But allies Lalu Prasad, chief of RJD and Nitish Kumar of JDU had stayed away, saying they were busy with seat allotment.